This amazing illustration is by Japanese artist Kendge Seevert of a Honda RC160. Seevert is renowned for his highly detailed illustrations of motorcycles. Apparently the RC160 was never raced outside of Japan and was usually raced on Japanese unpaved roads, which explains why it was mostly shown without a fairing and with semi-knobbly tires. 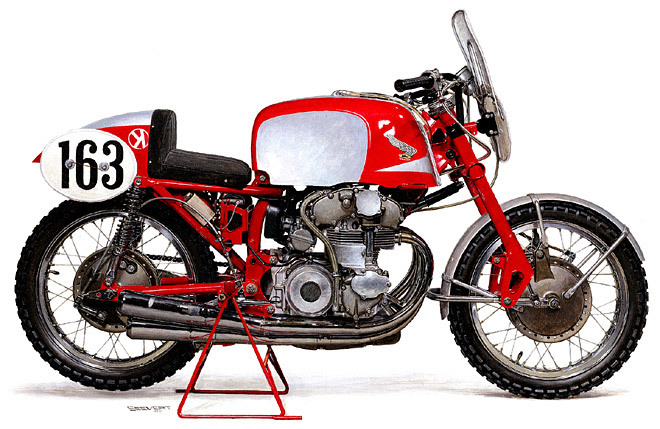 This is what Honda aficionado Joep Kortekaas says about this great looking racer “The Honda four, designated the RC160, had the same specifications as the 125cc twin, but the cylinders were now upright instead of being inclined, and the ignition was changed from magneto to battery with four coils. Claimed power output was 35 bhp at 13,000 rpm, with the same maximum engine speed of 14,000 rpm as the twin. The engine had a five-speed gearbox and weighed 58 kg. The cycle parts were nearly identical with the 125cc twin, the wheelbase being longer by 45 mm at 1310 mm, and the total weight of the bike was 124 kg”. You can read more about Honda and it’s racing history on vf750fd.com.